Flood waters rise in front of sales professional Jeff Silvio’s home. August is rainy season in Louisiana, but when Kris Washington, Pharm.D., Sr. Regional Medical Liaison, Diabetes Field Medical Affairs, saw sheets of rain falling in her state day after day earlier this month, she knew it wasn’t weather as usual. Back in New Jersey, Amy Dupuis, Vice President, Sanofi Foundation for North America and Sr. Manager, NA Corporate Social Responsibility (CSR), received more than the typical amount of calls and emails from field colleagues. “When we receive multiple communications from the field saying there’s an urgent need for products, that typically means the situation is dire,” says Amy. Kris and Amy, unfortunately, were correct. 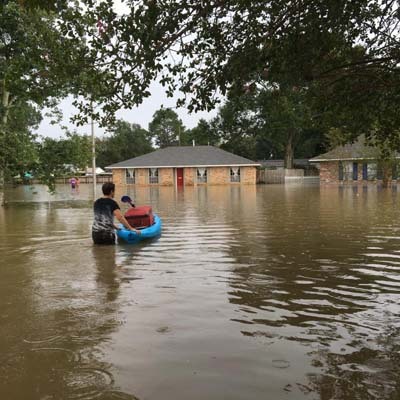 According to the American Red Cross, the recent Baton Rouge-area flood is the worst U.S. natural disaster since Hurricane Sandy, leaving at current count about 60,000 homes damaged, 20,000 people and 1,000 pets rescued, thousands in shelters and 13 people dead. Our response to the floods was corporate and personal, and in both cases, humanitarian. When sales representatives in Louisiana learned that colleague Jeff Silvio’s house was affected by the flood, they reached out to him with many offers of help. Jeff and his family have a place to stay, but is grateful for the company’s offer of temporary housing and the numerous expressions of support and kindness. “I am very thankful to the entire Sanofi family for all the thoughts, prayers and offers of help during this very difficult time,” he said. As flood waters continued to rise, Kris and sales professional Leanne Lea relayed information to CSR and our charitable partner Direct Relief about where needs were greatest. “I couldn’t go anywhere because the streets were flooded, but through collaborative communications with [healthcare professional] customers, Leanne and I were able to identify the shelters most in need,” said Kris. “I called Amy, who connected me with Direct Relief, and I was able to assist the charitable partner in directing resources to the hardest hit areas.” Another sales professional, Monica Alexander, drove one hour to provide insulin samples to a large endocrinology clinic that had exhausted its supply. Product donations of Lantus® SoloSTAR®, Lantus® Vials, Apidra® SoloSTAR®, Rifadin®, Lasix®, Adacel® and Amaryl®. A $5,000 donation to our charitable partner Direct Relief for relief efforts. A $5,000 donation to our charitable partner Heart to Heart for personal hygiene kits. A $5,000 donation to Children’s Heath Fund’s Baton Rouge Emergency Response & Recovery.